I’d seen so many lovely versions of Simplicity 2444 that I decided I should splash out and buy it myself. Except instead I stalked on Ebay for few weeks and managed to get it for about £2 including P&P instead of £8+, score! I was hoping this pattern would give me some dresses I could potentially wear to my friends’ wedding, and then also wear regularly enough that they weren’t just special occasion dresses. My first version is made of a pale floral polycotton remnant I purchased for 50p from a charity shop in Bude a few years ago. I’d never gotten round to using it because there wasn’t enough for a dress, and it’s a bit too stiff for the type of tops I normally wear. I decided to use the bodice part of 2444 to test the fit and add a self drafted peplum out of the remaining fabric. I wasn’t sure if the result would a) be wearable or b) be something I’d want to wear, as I’ve never done the peplum thing before. I finished the neck and armholes with a bias binding facing I made out of the scraps (the first time I’ve done it, and I think I pulled it too tightly as it’s a bit puckered), and serged the other seams. I made a pleated peplum by cutting the remaining fabric into two equal rectangles, and then one of those in half again to allow for the zipper, and made the pleats line up with the darts (sort of!). 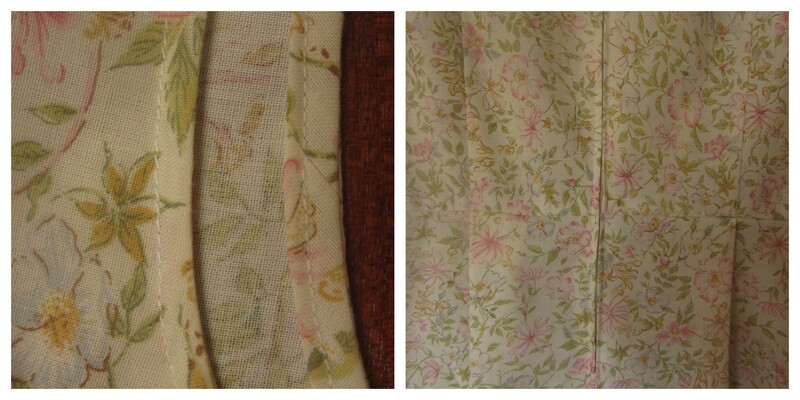 I didn’t want to lose too much length or make the hem too stiff, so it is serged and turned up once. Sidenote: The cows in the field behind my house are possibly the nosiest in the world. Except for one who was far to busy chewing the cud to run over and look at the silly girl taking photos of herself. (Gratuitous cow photos to follow). The fit is a bit loose, and there’s quite a lot of bagginess in the upper chest which seems to be common with this pattern. I’ve worn it more than a few times in the recent hot weather, as it’s quite breezy and cool, yet looks like I’ve made an effort, but it definitely needs some alterations. (Ignore the random chair I’ve been repainting for weeks…months maybe).